Very weak Bay Area winds. I know some of you hate meteorological geek talk like “upper troughs” since all you care about is the what size kite or sail you are likely to be able to use. 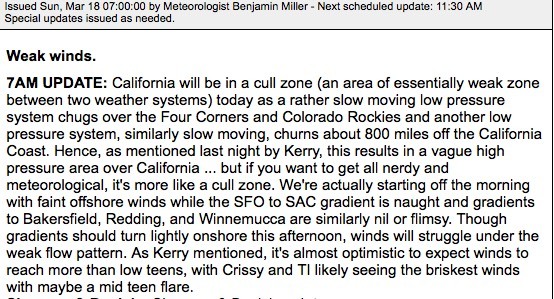 So you may have sighed when Ben introduced the term “Cull Zone” in today’s forecast. But at least Ben did a good job explaining what “Cull Zone” means and its implications for today’s Northern California wines. So I thought I would briefly show you what a “Cull Zone” looks like. And to also explain that it does not always mean weak winds. Looking this animation notice the large storm out in the Pacific and the much weaker storm over the Rockies. Finding the Bay Area notice that there is no trace of the North Pacific High which is usually around in the spring. Now, look at the isobars over the Great Basin and most of California. This weak area of high pressure between the two storm is a “Cull Zone”. The pressure gradients are very weak over Northern California so Ben is forecasting very weak winds. But you Baja fans are thinking “doesn’t high pressure in this area mean wind for Baja. Yep, check out the Sea of Cortez and the forecast winds for today. Lastly, where in the hell is the North Pacific High this March? Normally it is a major player this time of year. Well today it is mostly up in the Gulf of Alaska. Which is pretty weird. My guess is that it and its NW winds will reappear on our coast around Thursday.